Hydro Power was once the main source of mechanical power around the world with many waterwheels at the sides of rivers used for manufacturing or land irrigation. Today, “hydro energy” in the form of hydro power is making a serious comeback for electricity generation in many riverside homes. Increasing numbers of small hydro systems are being installed in remote sites around the world and there’s now a growing market for micro hydroelectricity production in many developing countries. 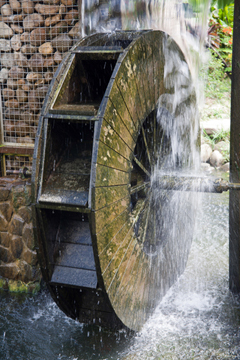 Hydro energy is still considered the longest-established alternative energy source as water wheels have been used for many hundreds of years. We are all familiar with mountain side hydroelectric projects which use large dams and turbines to generate several Mega-watts of electrical power. But not all hydroelectric power plants are that big. In many smaller or rural areas, and some parts of the world which do not have rivers that are large enough for big dams, small hydro electric power plants are being built instead allowing them to be used on a much smaller scale as hydro power is arguably still one of the most cost-effective forms of energy production. Hydro energy and Hydroelectric power generation depends of the basic physics of falling water by harnessing the energy contained in the water flowing or falling to a lower elevation. Moving water (kinetic energy) spins a turbine or wheel (mechanical energy), which drives a generator (electrical energy). Hydro power generation may be highly efficient but it is limited by the necessity of a suitable natural sites. While more than two-thirds of the planet’s surface is covered by water, developing a small hydro power site to extract power from water is not a simple task as there are many aspects which have to be taken into consideration with one of the principal decisions is firstly choosing a suitable site as a hydro power system is much more site-specific than a wind or photovoltaic (PV – solar electric) system. To determine the power available at a site, head and flow measurements must be taken as a sufficient quantity of falling water must be available to drive a turbine or waterwheel. The vertical distance that the water falls or drops from its highest point to where it is needed is called the “HEAD”, “Height of fall” or “fall height”, and is usually measured as a straight vertical distance in meters or feet. The quantity of water passing a fixed point at any one time is called the “FLOW” and is the rate at which water moves. Flow rate is usually measured in litres per second (l/s), gallons per minute (gpm), and even cubic feet per second (cfs). The amount of water flow can be measured by channelling the water into a pipeline, then into a container of a known volume, noting the time it takes to do so. Out of the two, head is usually more better because it uses the force of gravity to move the water meaning that a hydroelectric system can use less water and the turbine equipment can be much smaller. Also, with higher head heights the hydro turbine used is able to rotate at a much higher speed. However, at very high head heights, the velocity, pressure and force of the water can become a problem with the pipework. If the water flow is not constant and predictable, such as the difference between winter and summer rainfall, or when a relatively constant power output is needed to supply a home or lodge, a small dam or reservoir may be needed to restrict the flow of water and maintain a constant flow to the hydro turbine at a controlled rate. Damming the water flow will raise the level of the water surface, thus increasing the potential energy stored in the water that may be converted into electric power. It should be noted that the potential power derived from the water depends on its head height and flow rate so it is important to keep in mind that the systems output can only be accurately determined if these head and flow measurements are correctly made, so care should be taken during this process. Where Q is in m3/s, H in metres and g is the gravitational constant, 9.81 m/s2. Then we can see that the maximum theoretical power that is available in the water is proportional to the product of “Head x Flow”, as the pull of gravity on the water is always a constant. Therefore, P = 9.81 x Q x H (Watts). So for example, a hydro power system with a dynamic head of 10 metres and a flow rate of 53 litres per second could provide 10 x 53 x 9.81 = 5,200 Watts, or 5.2kW (kilo-watts) of water power. From this simple example we can also see that at a head of about 5 metres (16 feet), the power output is limited to about 2.6kW’s, 20 metres (65 feet) is about 10.4kW’s watts, and at a 30 metre (100 feet) head, 15.6kW’s can be generated, with the same water flow rate. Therefore, by increasing the dynamic head from 10 meters to 30 meters, 3 times more electrical power could be generated. But also, this example shows that to generate the same 5.2kW’s of power, a site with high head only needs a small flow rate while a site with a high flow rate only needs a small head. Although the Earth has plenty of water, not all of it can be used for hydro power. Some of the best rivers for generating electrical power, for example, are located near hills and mountains, where water runs downhill with much force and kinetic energy, while other rivers move too slowly to be useful. But with a growing DIY community and an increasing interest in environmentally friendly “green energy”, some hobbyists have endeavoured to build their own hydroelectric plants from old water mills, or from kits or from scratch. There are several different types of water turbine designs available which can be used in micro hydro installations with their selection depending on the head of water, the volume of flow. For higher mountainous regions where a water fall of 50 meters head or more is available, an impulse turbine such as the Turgo or Pelton wheel can be used. For low head battery charging installations, the Francis or Propeller-type turbines could be used which operate in a narrower range of head and flow. As most micro hydro power systems use pipes, designing and installing the pipe work (penstock) for a site with more than ten metres head can be very difficult as the length, diameter, and type of pipework used must be determined in order to reduce losses due to friction. As the water begins to flow, friction will reduce the available pressure, and as more water flows, there is more friction and the pressure continues to drop. Then the length of the pipework determines the total amount of friction for a given flow. Also at the turbine, a controlling valve may need to be installed to regulate the flow and the speed of the turbine. There are many factors which determine the voltage selection of a hydro power system including generator output and transmission line distance. DC (direct current) electrical power is usually generated at battery voltages of 12, 24 or 48 volts. Batteries will be required if a constant supply of flowing water is not available. Where transmission distances are too great for low voltage distribution, higher AC (alternating current) voltages can be generated and transformers used to step down to battery voltage. The efficiency with which generators convert water power to electrical power can range from 30 percent to 70 percent and as such it is generally not practical or cost effective to install a turbine generator that produces less than 100 Watts of electrical power (continuous). For more information about “Hydro Power” and how to generate your own electricity using the power of moving water, or obtain more hydroelectric power information about the various small scale hydro power schemes available, or to explore the advantages and disadvantages of hydro power, then Click Here to order your copy from Amazon today and learn more about small scale and low head hydro power systems which can be used for generating free electricity. I found your post comments while searching Google. It is very relevant information. Regularly I do not make posts on blogs, but I have to say that this posting really forced me to do so. Really awesome post. Really fantastic and I will be coming back for more information at your site and revisit it! Movers Thank you.